I want to thank all the bloggers who took part in this challenge. I was not going to take part, but Paula was going to have her ingredient list ‘orphaned’ so I decided to participate. I love making food with a random set of ingredients and so this challenge is a pleasure for me. 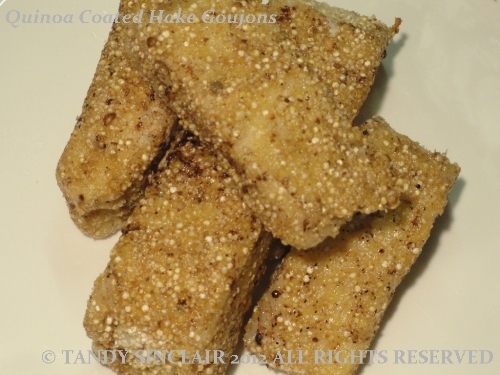 Paula challenged me to use the following 7 ingredients and I made Quinoa Coated Hake Gougons. For starters I decided to do a turnip and spinach soup and my side dish was mushrooms with spinach and gruyere. For my main course I chose hake – a soft white fish that is fished for off the coast in False Bay. These come directly from the company that fishes for them. I have never used quinoa before and so the night before, I made up some to go with our meal. This is a low GI grain with an unusual taste and texture – and Dave loves it. We are quite addicted to Chopped and so I used the the program for my inspiration here. I took the quinoa and ground it up to ‘bread’ the fish with. It added a great texture to this soft fish, and I am going to do this again. Oh, I do love quinoa as a coating and these look great – thanks Tandy.